Schraub is understating the problem here. No, the Farrakhan issue shows that some on the Left not only condone antisemitism but espouse it. The "anti-Zionism isn't antisemitism" argument is not an argument to support bashing Israel, but an argument to mainstream antisemitic thinking under the rubric of anti-Zionism. Saying that the Jewish people do not have the right to self-determination, yet Palestinians do, is antisemitic once you strip away the obfuscating arguments about settlements or refugees or whatever. Those arguments are meant to justify the underlying antisemitism of the position itself. Leftist anti-Zionism is functionally identical with antisemitism. And the reason they cannot condemn Farrakhan is because they largely agree with him. 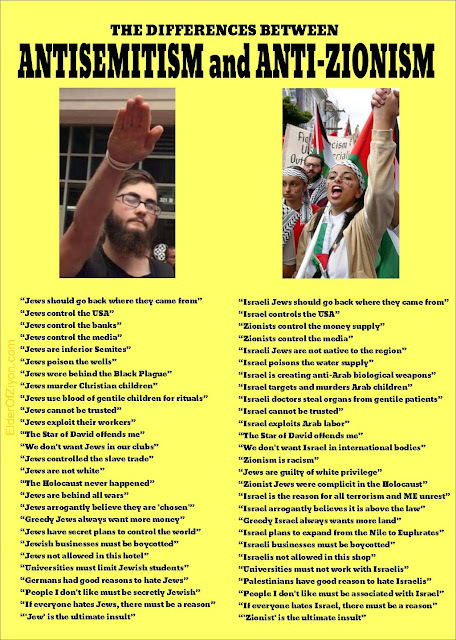 Even if you consider that too strong, the difference between how they treat racist or sexist speech and how they treat antisemitic speech says volumes about their ethics. Only when the far Right makes antisemitic statements - statements that are identical with Farrakhan's - do they pretend to be against antisemitism. They love far-right antisemitism because it gives them political cover for their far-left antisemitism masquerading as anti-Zionism. Although a broad range of people supported the Women’s March, it’s undeniable that some of its organisers have very dubious views, and no great surprise that one of these, Tamika D. Mallory, participated in the rally. Far from distancing herself from Farrakhan’s words, she has compounded the offence. Linda Sarsour has also joined in a really nasty attack on a woman who called out those supporting Farrakhan (see screenshots below). Although written 30 years ago, the question Lou Reed posed in ‘Good Evening Mr Waldheim’ is still fully relevant.